In China and many other parts of Asia, having the perfect eyelids is the ultimate sign of beauty. "Monolids," eyelids with no crease, which many people of Asian descent tend to have are, for some reason, considered less beautiful than the double eyelid common in people of other ethnic backgrounds tend to have. The desire to have the perfect double eyelid has spawned an entire plastic surgery industry. But in China, it seems to have gone off the rails. Now it's not just humans who are putting themselves under the knife for this operation, but pet owners are forcing their helpless cats to do so as well. Nanjing-based Jiangsu Television reported on one pet owner who decided to do just that. 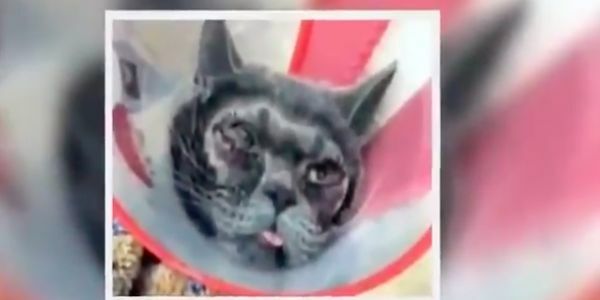 The person's unlucky cat was forced to undergo eyelid surgery because its owner thought its original eyelids were unattractive. Photos of the highly drugged and recovering kitten have since gone viral and stoked rage both in China and abroad. First of all, a pet parent just like a human parent should love their animal unconditionally no matter what it looks like. Secondly, forcing your animal to go through unnecessary cosmetic surgery for your selfish reasons puts their lives at risk. Finally, it is inexcusable in the first place that a vet would approve such cruel treatments for an otherwise perfectly healthy pet. This procedure is not about beauty, it's about selfishness and abuse. Veterinarians should not be allowed to perform this disgusting procedure on animals simply because their owners want them to look more aesthetically pleasing. Please sign this petition and ask the Chinese government to take a stand against unnecessary animal cruelty against pets. Ask them to ban pet cosmetic surgery.